One of the hardest types of hives to deal with is, hives on your feet. The itching and swelling makes hives on feet almost unbearable as you must use your feet all day long. Hives on feet are itchy, red, raised welts on the surface of the skin that seem to appear out nowhere. They are typically brought on by an allergic reaction to something that made contact with your feet. In response, your immune system sends histamine into your blood stream to fight off the allergens your feet have come in contact with. Once you get hives on feet, you will most likely get it again and again and each time the hives outbreak will last longer and longer. The condition is curable 95% of the time with the right hives treatment though. What Causes Hives On Feet? Hives on feet can be caused by the material in your socks, the pressure of your shoes on the skin, your feet overheating, foot lotions, soaps, detergents, stress, too much sunlight (see sun hives), insect stings or bites, cold temperatures and handling or eating certain foods (such as egg whites for my 2 year old toddler). The most common foods that cause the allergic reaction you see in hives on feet are are tree nuts, peanuts, milk, eggs, tomatoes, berries, wheat and soy. Most of the hives on your feet will go away within a few hours to a couple of days. However, there are chronic cases that last longer than 6 weeks, where a trigger is never found. If you can determine and remove the trigger, you'll be one step closer to avoiding another outbreak of feet hives. If you can not ascertain the trigger (over 75% of cases never find the trigger), then your only other option is a hives medication. What Are The Symptoms of Hives On Feet? Itchy raised, red welts on your feet that may swell up into red or skin colored welts (known as wheals) - usually with clearly defined edges. Hives on feet tend to appear quickly and fade away over time. Hives on feet can spread to other regions - especially if the reaction is caused by a an allergen touching your skin. This is exactly what happens when my 2 year old toddler touches egg whites and peanut butter. 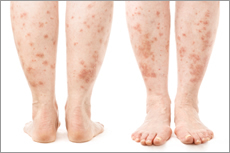 Hives on feet have been known to change shape and merge into large areas of raised reddish skin. Hives on feet can disappear and reappear within minutes, hours or days depending on the allergen exposure. Are Hives On Feet Dangerous? Hives on feet are your body's way of trying to kill whatever allergen your feet came in contact with. They are more annoying and painful than dangerous unless they are accompanied by angioedema. Angioedema looks similar to hives on feet, except the swelling is seen below the skin instead of on the surface. Angioedema can take place in the hands, feet, lips, face and even the throat. This condition reacts much like the hives on your feet and will go away when the allergen is removed completely. In rare cases, angioedema has been known to restrict breathing to the point that each breath becomes harder and harder, resulting in fainting and potential suffocation. If you find this happening to you, call 911 ASAP! How Do I Get Rid Of My Hives On Feet? Hives on feet have been known to last for up to a month, depending on how quickly you get treatment. For the vast majority of people we've heard from, the hives medication OxyHives works best. It has none of the harmful side effects other medications do and has proven to eliminate hives outbreaks for many of the people we've heard from. OxyHives is one of the few over the counter medications that works well with hives outbreaks on hands and feet. Learn more on our hives treatment page. You can order OxyHives directly from the manufacturer's website at www.oxyhives.com. In around one percent of the hives on hands cases, a dermatologist will prescribe a steroid. However, keep in mind that steroids tend to have the following negative side effects: high blood pressure, weight gain, jaundice, liver tumors, fluid retention, etc. If you get hives on your feet more than once, write down the foods you have eaten or that came in contact with your feet as well as any medications and stress levels or changes in any detergents or soaps. Doing this regularly, if you have recurrent cases of hives on feet, will help you to determine your triggers. Staying away from triggers, as well as using OxyHives, will help you eliminate your feet hives once and for all.